One of the subscribers to the New Canaan Market Report for October asked for a Wilton report. There is no such thing. So, I am going to write one right here, right now. 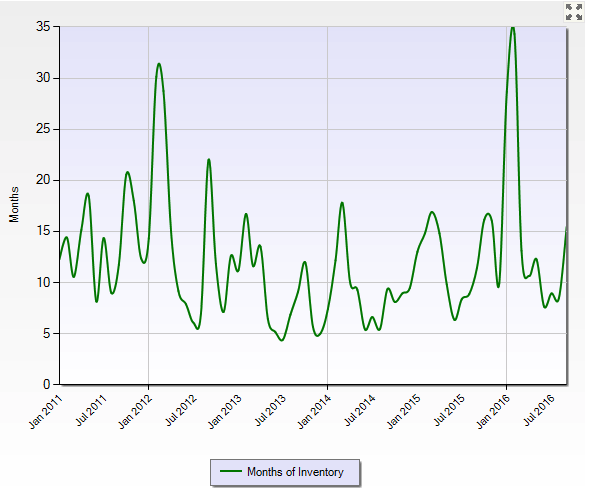 First, here is a chart of the amount of inventory in Wilton over the last five years. With the exception of spikes in the beginning of 2012 and again in 2016 it would appear we are at more normal levels of 9-15 months of inventory. 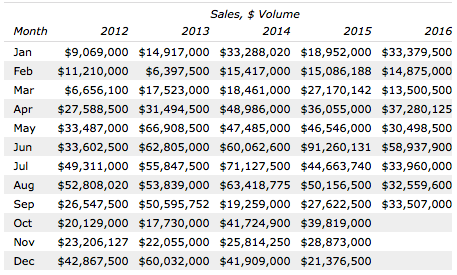 Next, we look at the number of Sales and the Dollar Volume of Sales. They should track along together and for the most part they do. The fact that the Dollar Volume is lagging the Number of Sales this year tells me that the volume of lower priced homes has accounted for most of the activity in 2016. I think Wilton represents great value in comparison to New Canaan, Westport, Darien and Greenwich. If you assume the schools are equal the difference in price should correspond to the higher taxes and longer commute to New York City. Historically that has accounted for a 40% (or less) difference in values. However, currently the Wilton market is selling at a 45% discount to the New Canaan and Darien markets. Consider 2008 when New Canaan was $1.4 million to $853,000 in Wilton, a 39% difference. Consider 2012 when New Canaan was $1.23 million to $713,000 in Wilton, a 43% difference. Now, New Canaan is currently at $1.36 million to $746,000 in Wilton, a 45% difference. 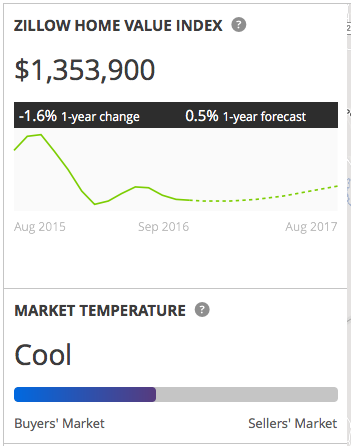 Zillow is projecting New Canaan to move to $1.38 million and Wilton to $754,000, a 45% difference. There has been plenty of hand-wringing this year about the state of the local real estate market, much of it justified. Sales volume dropped and prices were slow to react. 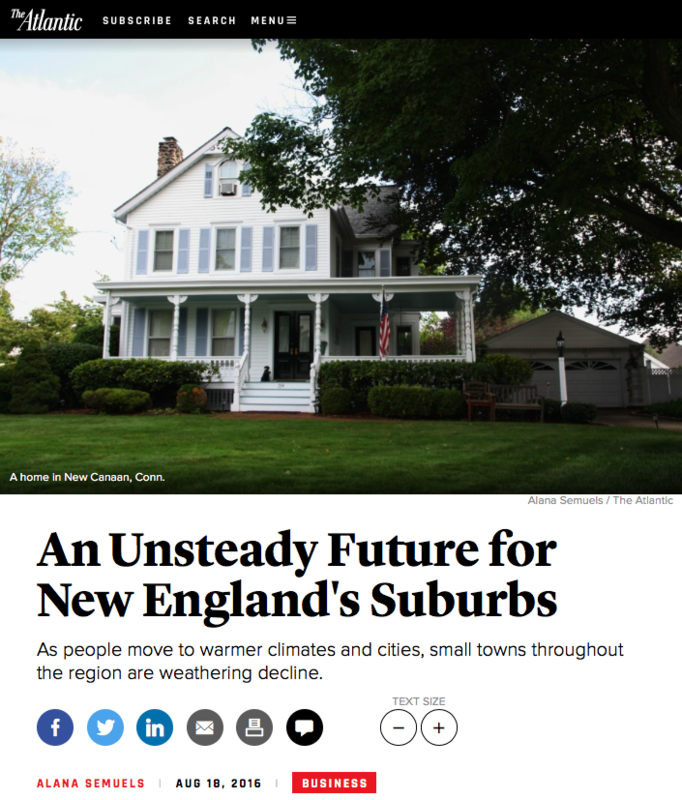 An article in last month's Atlantic Magazine attributed a soft suburban market throughout the northeast to the fact that we aren't supplying what buyers want, particularly young buyers. The Atlantic seems to think that Millenials don't want the suburban lifestyle any longer. They're moving to the cities where they can always catch an Uber. The article goes on to cite county and state statistics which show median prices about 20% down from the 2003 high. However, New Canaan has fared better than most. This summer was pretty slow, but average and median prices had been holding firm through summer. As I mentioned above, this Fall we are now beginning to see seller's reductions of between 5% and 12% in response to the slowing sales volume. 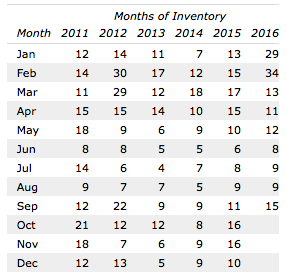 We now have 18 months of inventory on hand heading into the slower winter months, up from 14 months a year ago. Zillow shows the New Canaan market values as down only one percent since last year. They are predicting the New Canaan market is poised to rise nearly one percent next year. July and August were not pretty for New Canaan. 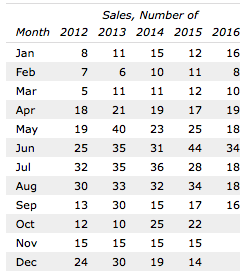 You can see in the chart below that sales held steady through May, began the decline in June and dropped 40% in July and 50% in August when compared to 2015. This was not unexpected based on the dwindling number of pendings recorded in June, but it has been a wakeup call for many of us nonetheless. In fact, pending sales were down in June (-58%) and July (-30%) but set a new low in August (-79%). The trend continued in September with 16 pending sales indicating that we may have not seen the bottom. Pending is not the only measure of market health. (It's not even a very good one. It really only gives us a peek at sales volume a month or two ahead.) 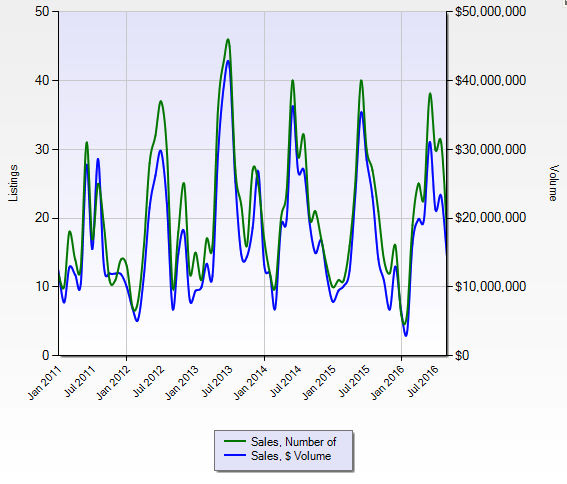 Here is a chart that shows the past 5 years of Sales Volume for Single Family Homes. We see an increase in the volume in September over three of the previous four Septembers. 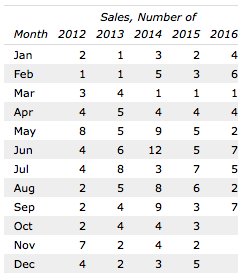 The condo market bounced back this month with 7 sales in September after a disappointing August. The condo market has been negatively affected at times in the last few years by a lack of inventory to satisfy demand, especially under $1 million. We never seem to have enough condos to meet the need. As a result, in the last five years we have seen more new condos built in town than were built in the previous 20 years. New construction on Jeliff Mill Road, Park, Main and Forest Streets as well as The Maples on Oenoke Ridge. Now, with projects planned on Hoyt, Cross and Vitti, the Silvermine Tavern, The Roger Sherman and the Merritt Village we predict the condo market will continue to experience growth over the next decade. This new inventory is coming online as a great range of buyers begin to seek the price point and convenience that condos offer. 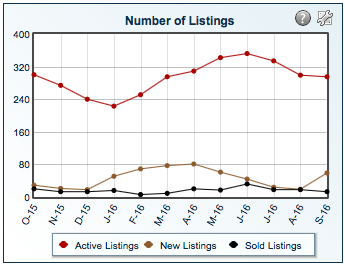 The big story for 2016 is the number of listings (of single family homes). Everybody is asking have we seen the peak? 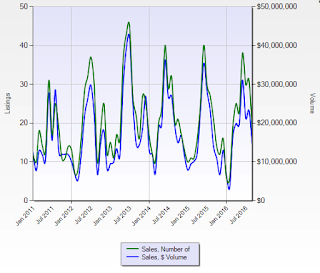 Yes, with 297 homes on the market now, down from a high of 360, we have seen the peak for 2016. Below is a link to the New Canaan Market Report. If you would like to discuss the report, or if you have any other questions, feel free to contact us at 203-247-4700 (John) or 203-247-5999 (Susan). 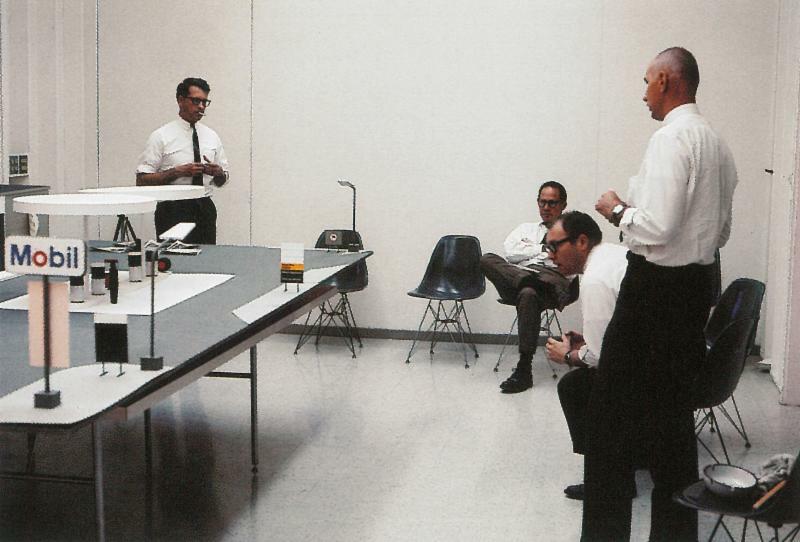 Pioneers of Design and Architecture in New Canaan: Eliot Noyes, Brad Verbryke, Ernest Bevilacqua and Bob Graf in an internal meeting to discuss Mobil Oil, c.1968. We have listed Bob Graf's own home, designed in 1966, at 62 Moriarity Drive in Wilton.